Home / Posts Tagged "summer squash"
This is my favorite thing to eat in August when corn and green beans are ready, there is lots of summer squash, and new potatoes are just coming in. It’s colorful, full of bright flavors, and totally satisfying for breakfast, lunch, or supper. It’s good cold as leftovers. It practically makes itself, and unlike many of my recipes, this one contains neither garlic nor Parmesan. Everything but the salt, pepper, and olive oil can be found at Upper Valley farmers’ markets and farm stands or maybe your CSA or backyard. Buy locally! Eat seasonally! 1 pound new potatoes, skins on, sliced ⅛ to ¼ inch thick. 1. 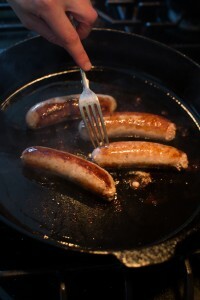 In a large skillet (10” or so) brown sausages on medium-high heat. 2. When sausages are half cooked, add onions and peppers and some salt. 3. 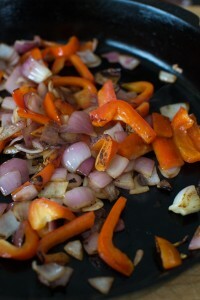 Let peppers and onions get nice a nd browned before stirring. 4. When sausages are just cooked, remove them and the onions and peppers and set aside. Pour ¼ cup water into the pan to “deglaze” it – that is, get all the tasty browned flavors and bits off the pan. Add this pan juice to the sausages. 5. Wipe out pan to remove any sausage bits left. 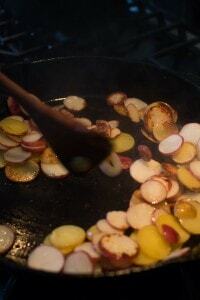 Heat a couple tablespoons of oil on medium high and add the thinly sliced potatoes in a single layer. Salt well. Let them brown them well before turning. 6. Add corn kernels, and summer squash. Let veggies brown before turning. 7. Break apart sausage into chunks and add sausage, onions, peppers, and pan juice back into hash along with chopped green beans. 8. Cook until green beans are tender and sausage is heated again. Test a potato too to make sure it’s cooked through. 9. Garnish with fresh chopped herbs. Serve with hot sauce. This hash is ideally cooked in a large skillet so that the vegetables sit in a single layer to brown equally. Don’t have a nonstick pan? You don’t need one if you add ingredients to a sizzling hot cast iron or steel pan. Then lower heat to medium and don’t turn the ingredients until they’re browned, when they’ll start to release on their own. I’m making the most of the summer vegetable supply before the first frost shows up – which could be any day now – which is why this light, delicious summer squash salad is a perfect addition to any meal. This recipe comes to us from the Norwich Inn‘s chef Luis Luna. The Inn served this on the summer menu and Luis was nice enough to share the recipe with Everyday Chef. Luis juliennes the squash with a mandolin – which makes perfect shoestrings from the summer squash. I don’t have a mondoline, so, I used a spiralizer – which can make vegetable “noodles” from almost any vegetable. My version wasn’t quite as professional looking, but it still tasted great. Simply blanch the julienned squash and red peppers for 1 minute, drain and cool. Mix together the lime juice, honey, water, sweet Thai chili sauce, and chives. combine the blanched vegetables with the sauce and add salt and pepper to taste. It’s that simple! I love this great new way to enjoy one of my favorite summer vegetables, that is light, easy, a so quick to make! Winter squash has to be my favorite food of the season, followed up by apples and fresh cranberries. But for the longest time there was one winter squash I never liked, the spaghetti. For many, the pasta like consistency of cooked spaghetti squash is a welcome alternative to actual pasta. That’s a quality I can appreciate, as it opens the door for creativity. Yet I could never get over its overwhelming blandness. No matter how I cooked and seasoned the squash, it always turned out with zero flavor. And so I wrote it off as the black sheep of the winter squash family. Until now. Finally, in Isa Chandra Moskowitz and Terry Hope Romero’s Veganomicon, I found a phenomenal spaghetti squash recipe. The squash is baked until tender, added to a mildly spicy onion, jalapeno, corn and black bean mixture and then topped with a tomato, avocado and tropical fruit salsa. There are many flavor profiles at play here and they all work. It’s anything but bland. The other great aspect of this dish is that it takes advantage of several foods that are perfectly in season right now in early October, including onions, tomatoes, peppers and corn. Seriously, make this now, before tomatoes and peppers have completely disappeared. As with any dish that requires roasted squash, I suggest taking care of the roasting in advance. It really simplifies things. Maybe when you’re relaxing the evening before you’d like to use it, just toss the squash in the oven for about an hour. If you didn’t plan ahead (and I know how that is) and aren’t opposed to the microwave, you could use it to cook the squash a little faster than the oven. The flavor of the salsa will only get better after chilling, so consider preparing it in advance as well. With the squash and salsa ready to go, this meal could be ready in 20 minutes. Preheat the oven to 375°F. Cut the squash in half lengthwise, scoop out the seeds and place in a baking dish cut side down. Bake until tender and easily pierced with a fork, about 45 minutes. This step can be done up to 3 days in advance. In a bowl toss all of the salsa ingredients together. Chill until using, which can be up to 2 days in advance. Heat the oil a large skillet over medium heat. Add the onion, jalapeno and garlic. Cook about 5 minutes before adding the spices, salt and wine/broth. Cook another 5 minutes. Add the corn and black beans and simmer over low heat until the liquid has reduced and vegetables are tender. When squash is finished cooking and cool, use a fork to scrape the strands into the pan. Toss with the bean mixture to combine and allow to heat through if the squash was precooked. Serve in bowls topped with the salsa. This recipe was adapted (mostly just the seasonings) from Veganomicon, an excellent cookbook and resource for vegan and vegetarian cooking. Have you seen these funky bright yellow squashes? They kind of look like flying saucers. What you might not know is that they’re alien free and taste just like your regular old yellow summer squash. But better. I say pattypans are better because let’s be honest – summer squash can be rather bland on its own. The difference with these is that you can scoop out the filling, mix it with a few flavorful ingredients and after briefly baking, have a delicious squash dinner vessel. You dig right in and enjoy – just like a stuffed pepper. Set your grains to cook in a small pot on the stove if you don’t already have some ready to go. Slice the top off the pattypans and using a spoon, scoop out the insides and reserve. If needed, make a TINY slice off the the bottom of the squashes as well to help them stand upright. Coarsely chop the reserved squash filling. Heat a saute pan over medium heat with the oil. When hot, add the garlic and onion. Cook for two minutes then add in the broccoli, chopped squash and lemon zest and salt to taste. Cook for another 4-5 minutes. Toss the veggies with the cooked grains, parsley and seeds. Fill into the hollowed squashes. Place the stuffed patty pans into a baking dish and bake for about 25 minutes. When the squash is easily pierced with a knife, they’re good to go. Optional: Top with the sprinkled Parmesan and place under the broiler for 2 minutes. Slice off the top and scoop out the flesh with a spoon. Give the flesh a good chop and set aside for now. The base of my filling was protein rich quinoa with a handful of dried currants thrown in during cooking. Any grain you like can work, though. You just want to cook it first. So, if you don’t have any cooked grains ready to go – this is your first step. Cook garlic and onion in a little oil over medium heat. Chop some broccoli and after a couple minutes, mix that into the pan with the squash filling. Season with salt and let cook 5 minutes. Toss the quinoa, cooked veggies, pumpkin or sunflower seeds, parsley, and zest of 1/2 a lemon together. Now stuff into the hollowed pattypan. Set in a baking dish and bake for 25 minutes at 375F or until the squash is easily pierced with a knife. Afterwards, you can sprinkle the top with Parmesan and place under the broiler for a couple of minutes to brown. What are you waiting for? Get stuffing. For the month of January, Veggie Of the Month is focused on winter squash. While there are many winter squash varieties out there, my favorite is butternut. I find it easy to work with and versatile. And the great thing is that winter squashes like butternut keep for an extended period of time if stored well – that’s why we’re talking about it in the month of January, when it was harvested sometime in the fall. I found several farmers at the Rutland market carrying them this past weekend. What I also like is how the butternut squash is used with the pasta. Typically winter squash takes a longer period of time to cook, but we’re going to grate it and that knocks the cooking time down to just a few short minutes. You want to start by cutting the top off of the squash and carefully slicing down the middle from the top. Just watch your hands. When you’ve cut the squash open use a spoon to scoop out the seeds. Sometimes I save them and roast them to later top salad or soup. But I’ll leave that up to you. Some winter squashes, like acorn, are not so easy to peel. Butternut, with its smooth surface, doesn’t take long. Afterwards, you’re going to want to grate the squash with a handheld grater or with the proper disc attachment on your food processor. I found it easier to grate by hand by breaking a half into smaller, easier to handle pieces. One of my favorite pairings with butternut squash is sage. If you haven’t already, check out the butternut squash, apple and sage soup I made in the fall. You’re going to want to roughly slice the sage leaves into smaller pieces, but you don’t need to go crazy. Before serving, I top the pasta with toasted walnuts. You shouldn’t be intimidated about toasting nuts. Toasting noticeably enhances the flavor. And as long as you don’t forget about them, it’s easy. Just place them in a pan over medium high heat as you prep the rest of the ingredients. Give the pan a shake once in awhile. They’ll be done when you notice a slight browning and nutty aroma. Start a large pot of water over high heat for the pasta. Heat oil and butter in a large heavy pot over medium heat. Add garlic, onion, and red pepper flakes. Cook for about two minutes before adding in the squash and sage. Stir occasionally, until squash begins to brown, about 4 minutes. When the water is boiling, add a couple pinches of salt and the pasta. When cooked al dente, drain, reserving 2 cups of the cooking water. Add pasta and 1/2 cup pasta water to the squash and stir to coat. Cook over medium heat, stirring, adding more cooking liquid as needed, until squash coats pasta. Divide pasta among bowls and top with the walnuts and cheese, if using. What’s better than roasted squash on a fall day? Combine it with some fresh apple cider and make soup. I was having friends over for dinner two nights this weekend and made up a large batch of this to serve as first courses for both. I don’t often serve full, proper courses for dinner, but I have winter squash hiding out in every corner of my small apartment. And yet, I still buy more. There are so many great varieties and uses, I can contentedly eat it for the next six months. This soup has an interesting ingredient – Worchestshire sauce. In case you’ve ever wondered -Worcestershire Sauce, dating back to the 19th century, is an English blend of brined anchoviess, tamarinds (an Indian date-like fruit), molasses, garlic, vinegar, chilies, cloves, shallots and sugar. It’s an interesting and yet underutilized staple ingredient. So, no wonder, it would add a nice boost to this, and probably, most soups. Fresh sage helps make this kind of awesome as well. Again, another ingredient I don’t take advantage of often enough. When I do use them, I like to saute them up in a pan with a little oil and fry until crisp. Fried sage leaves would make an excellent garnish to this soup. Preheat oven to 425 F. Halve each butternut squash and scoop out the seeds. Sprinkle with sage, maple syrup, salt and pepper. Dot with butter. Roast 45-1 hour until the squash is tender. Remove from oven, allow to cool slightly, then scoop out flesh. Heat olive oil in a large sauce pot. Add in shallot and sauté over medium-low heat until tender, about 5 minutes. Add in scooped out butternut squash, chicken stock, apple cider, brown sugar, Worcestershire, nutmeg and red pepper flakes. Season with salt and pepper to taste. Bring to a simmer and cook 30 minutes. Puree with an immersion blender. Return to pot, taste and adjust seasonings. At the last minute, stir in heavy cream and serve garnished with diced apple, fried sage leaves, or a spoonful of Greek yogurt, swirled.